Offering you a complete choice of products which include multifunction chirag pallet free block machine, multifunction chirag pallet free concrete block making machine, multifunction chirag pallet free hollow block making machine, multifunction chirag pallet free paver block making machine, multifunction chirag pallet free brick making machine and chirag high quality block machine. The Multifunction Chirag Pallet Free Block Machine forming machine is newly developed by our company, is a special equipment for producing building blocks. The machine can use fly ash, slag, coal gangue or other industrial waste residue and river sand, gravel, cement and other materials to produce hollow blocks, perforated bricks, curbs, pavers and grasses of various specifications by changing the mould. Concrete products such as bricks, ring tree bricks, and slope protection bricks. Plus fabric fabrics can also produce layered products. The main frame of Multifunction Chirag Pallet Free Block Machine forming machine adopts detachable vertical double frame structure, which is made of super large and strong steel. It is strong and vibration resistant and has good reliability. It adopts indenter and stripping double clamping method to ensure reliable movement of product removal and swaying. The structure, the fabric is fast and uniform, the product strength error is very small, the stability is high, and the scrap rate is low. The Multifunction Chirag Pallet Free Concrete Block Making Machine forming machine is newly developed by our company, is a special equipment for producing building blocks. The machine can use fly ash, slag, coal gangue or other industrial waste residue and river sand, gravel, cement and other materials to produce hollow blocks, perforated bricks, curbs, pavers and grasses of various specifications by changing the mould. Concrete products such as bricks, ring tree bricks, and slope protection bricks. Plus fabric fabrics can also produce layered products. The main frame of Multifunction Chirag Pallet Free Concrete Block Making Machine forming machine adopts detachable vertical double frame structure, which is made of super large and strong steel. It is strong and vibration resistant and has good reliability. It adopts indenter and stripping double clamping method to ensure reliable movement of product removal and swaying. The structure, the fabric is fast and uniform, the product strength error is very small, the stability is high, and the scrap rate is low. The Multifunction Chirag Pallet Free Hollow Block Making Machine forming machine is newly developed by our company, is a special equipment for producing building blocks. The machine can use fly ash, slag, coal gangue or other industrial waste residue and river sand, gravel, cement and other materials to produce hollow blocks, perforated bricks, curbs, pavers and grasses of various specifications by changing the mould. Concrete products such as bricks, ring tree bricks, and slope protection bricks. Plus fabric fabrics can also produce layered products. The main frame of Multifunction Chirag Pallet Free Hollow Block Making Machine forming machine adopts detachable vertical double frame structure, which is made of super large and strong steel. It is strong and vibration resistant and has good reliability. It adopts indenter and stripping double clamping method to ensure reliable movement of product removal and swaying. The structure, the fabric is fast and uniform, the product strength error is very small, the stability is high, and the scrap rate is low. 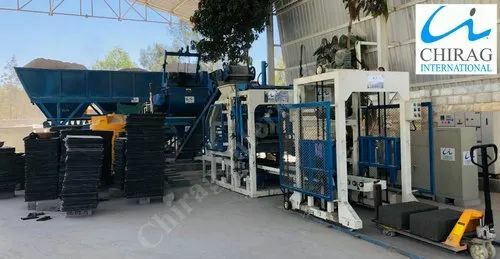 The Multifunction Chirag Pallet Free Paver Block Making Machine forming machine is newly developed by our company, is a special equipment for producing building blocks. The machine can use fly ash, slag, coal gangue or other industrial waste residue and river sand, gravel, cement and other materials to produce hollow blocks, perforated bricks, curbs, pavers and grasses of various specifications by changing the mould. Concrete products such as bricks, ring tree bricks, and slope protection bricks. Plus fabric fabrics can also produce layered products. The main frame of Multifunction Chirag Pallet Free Paver Block Making Machine forming machine adopts detachable vertical double frame structure, which is made of super large and strong steel. It is strong and vibration resistant and has good reliability. It adopts indenter and stripping double clamping method to ensure reliable movement of product removal and swaying. The structure, the fabric is fast and uniform, the product strength error is very small, the stability is high, and the scrap rate is low. The Multifunction Chirag Pallet Free Brick Making Machine forming machine is newly developed by our company, is a special equipment for producing building blocks. The machine can use fly ash, slag, coal gangue or other industrial waste residue and river sand, gravel, cement and other materials to produce hollow blocks, perforated bricks, curbs, pavers and grasses of various specifications by changing the mould. Concrete products such as bricks, ring tree bricks, and slope protection bricks. Plus fabric fabrics can also produce layered products. The main frame of Multifunction Chirag Pallet Free Brick Making Machine forming machine adopts detachable vertical double frame structure, which is made of super large and strong steel. It is strong and vibration resistant and has good reliability. It adopts indenter and stripping double clamping method to ensure reliable movement of product removal and swaying. The structure, the fabric is fast and uniform, the product strength error is very small, the stability is high, and the scrap rate is low. We are manufacturers and suppliers Chirag High Quality Block Machine of Especially designed using best grade raw materials and advanced technology. These are equipped with all the necessary accessories making them easy to operate. We are engaged in offering a wide range of Chirag High Performance Hollow Block Machine ( This machine is Multifunctional, Could make all kinds of Blocks,Bricks and Pavers while change the moulds.) Simple structure; small occupying area; stable and reliable function and convenient maintaining; Simple manual operation enables the workers to learn fast; This machine combines many functions into one with low consumption. It is adopting with multi-valves in series, electricity discharging unit and compressing and vibrating organic combing unit to materialize the highest molding and density of the finished products.Auto pallets conveying, pallets feeding and compulsive materials arranging have highly raised up the production efficiency and reduced the working intensity, while simple pallet conveying and feeding units can be installed for production. We hold expertise in offering an exclusive range of Chirag Immense Technology Cement Block Machine to our clients, which is made using best grade raw materials and advanced technology. These are highly demanded for its special features optimum performance and corrosion resistance make it highly demand able in the global arena. We meet the bulk demand of clients within a committed time frame. Price Range: Rs. 14,00,000 and Above. 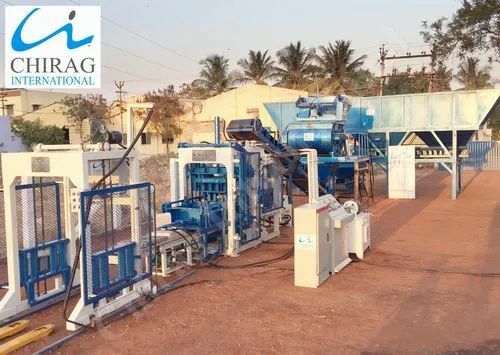 Chirag Mega Technology Block Making Machine offered by us can be used for making all types of construction material such as fly ash brick, concrete block, interlocking brick, interlocking block, interlocking paver etc. We are engaged in offering a wide range of Chirag Hi-Technology Interlocking Block Making Machine. This machine is Multifunctional, Could make all kinds of Blocks, Bricks and Pavers while change the moulds. Simple structure; small occupying area; stable and reliable function and convenient maintaining; Simple manual operation enables the workers to learn fast; This machine combines many functions into one with low consumption. It is adopting with multi-valves in series, electricity discharging unit and compressing and vibrating organic combing unit to materialize the highest molding and density of the finished products.Auto pallets conveying, pallets feeding and compulsive materials arranging have highly raised up the production efficiency and reduced the working intensity, while simple pallet conveying and feeding units can be installed for production. We offer an exclusive range of Chirag Latest Technology Vibration Block Making Machine to our clients, that are especially designed using best grade raw materials and advanced technology. These are equipped with all the necessary accessories making them easy to operate. These are highly demanded for its features like higher efficiency, durable finish standards, and reliable service life. We offer our range at cost efficient prices. We are manufacturers and suppliers of Chirag Powerful Performance Concrete Block Machine Especially designed using best grade raw materials and advanced technology. These are equipped with all the necessary accessories making them easy to operate. Looking for “Multifunction Chirag Pallet Free Block Machine”?